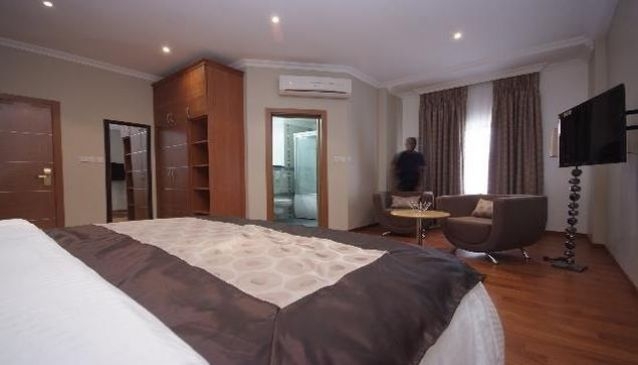 Morning Side Suites located in the upmarket neighborhood of Victoria Island in Lagos, it is a 4 Star Boutique Hotel conveniently and ideal for both the business and leisure traveller. The hotel hosts outstanding facilities such as: Gymnasium,Outdoor swimming pool, Sun Terrace, Restaurant,Cocktail Bar,Poolside Bar, 24 hours Room ServiceHeating, Air conditioning, Conference Facility and packages for up to 50 people,24hrs Power facilities, Daily Housekeeping, Flat screen television and Wi-Fi . Their services are exceptional and a superb staff to complement. The hotel features 38 Elegant Guest Rooms, consisting of 36 Classical Rooms and 2 Luxury Suites all equipped with modern amenities. Their fine-dining a la carte restaurant offers a range of both international and traditional cuisine. The cocktail bar offers a range of snacks and beverages whilst you relax or enjoy sun downers at our pool bar or terrace.